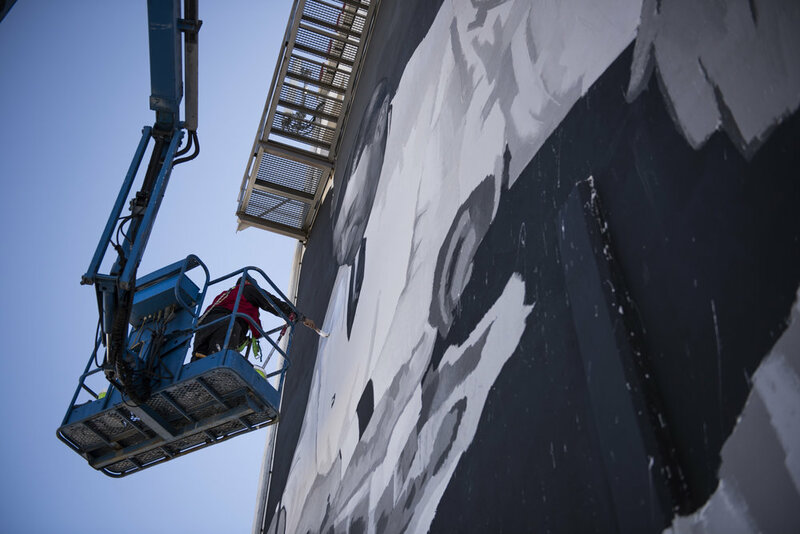 "The mural is based on a photograph of Dr. Egas Moniz accompanied by his assistant Deolinda in Lisbon’s Santa Marta Hospital during the 1930s. Born in Estarreja, Moniz was a dedicated psychiatrist and neurosurgeon that was also passionate about art, especially within the community. Even today, if you went to the door of his home it reads “the great schools of fine arts are the museums. I wanted one in every town and in every village for the people to rise in spiritual communion of the beauty.” The photo in Moniz’s archive impacted Mohamed L’Ghacham and became the source of his inspiration. The 1930’s was a pivotal era that later defined him- introducing lobotomies and angiographies which awarded him the Nobel Prize in Physiology and Medicine in 1949. The viewer feels as though they’re looking in on a moment shared between Moniz and his trusted affiliate."